For All Seasons have been one of my favourite up and coming bands over the last year or so, as this relatively new trio from California rose to prominence and significance through their 2013 album High Above It All– which spawned the powerful radio hit “High Above It All” (of which Phillips, Craig and Dean covered on their 2014 album Above It All). Since that album, the band unveiled two more ‘live-in-studio’ EP’s, and then were eventually signed to Centricity Music, home of artists like Jason Gray, Plumb, Andrew Peterson, Unspoken and Lauren Daigle, to name a few. The band unveiled to us an EP titled Clarity in early 2018 under Centricity, and while the EP itself was a little on the shorter side, the collection of songs was in fact one of my favourite EP’s of that particular year. While at face value the band may seem like any other worship movement that is popular at the moment (think Jesus Culture meets Desperation Band meets Hillsong and you can probably guess what the band sound like), For All Seasons nevertheless deliver songs full of enthusiasm and passion- the band continues to assert their prominence in today’s CCM/worship music scene with Clarity and their standout songs in ‘Higher’, ‘Bigger Than’ and ‘No Other’. Now fast-forwarding until the beginning of 2019, we see yet another unveiling, this time a single ‘Every Good Thing’. For All Seasons have since decided to unveil music in a different model- one song per month for a whole year, have partnered up with patreon, and are launching their own podcast series discussing about the new songs…and it’s only January 2019. And so what does ‘Every Good Thing’ has in store for us fans of this trio? Is the podcast worth listening to? Should we all just sign up to patreon? For me personally, I don’t have the money to part for patreon on a monthly basis, and with the job I undertake listening to podcasts in a prolonged manner can seem a little difficult to undertake, so for me, just hearing the song is enough to get me excited with anticipation that I could listen to their podcast…someday. 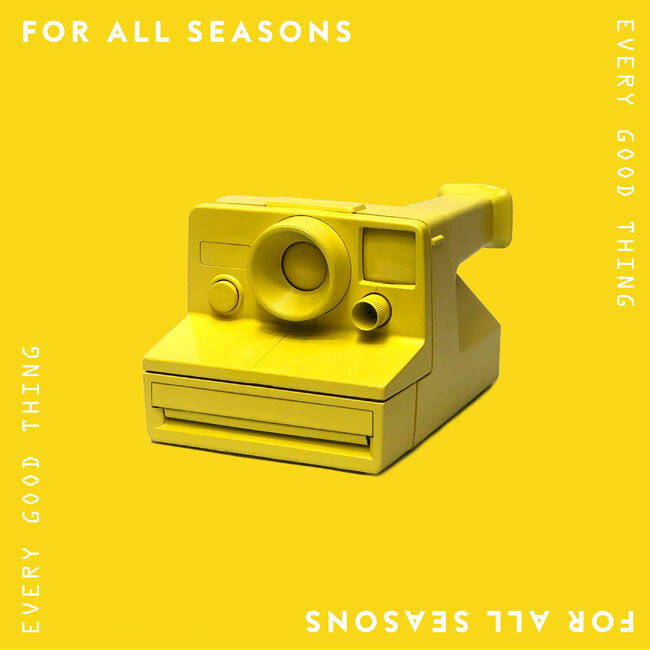 What I will say is this- ‘Every Good Thing’ is everything we can hope for from a For All Seasons song, and more. With a strong percussion undertone, lead singer Emily Hamilton’s powerful voice asserts the fact that ‘…every good thing comes from You…’, with the message of the song being very similar to that of The Afters (the song of the same name released in 2013). Nevertheless, this trio have given to us something that is catchy and easy-to-remember, a song that will hopefully be on our lips for longer than just however long it takes for the next chart-topping hit to be in our homes via the radio. It is with this quote I will leave you, and say that such a song like this can change the sonic and thematic landscape, as we’re reminded that every good thing that comes from God has come to us to make our lives better and fulfilled. The band themselves have given us a reminder to always seek the Lord first in whatever we undertake, that whatever come is a direct result of our fervent and enthusiastic obedience to whatever the Lord has in our way to undertake at various circumstances in our lives. Good things are to be acknowledged to be from the Lord, and often we forget that. We’re always quick to point the finger to the Lord when we fail, but when we’re doing well, we hardly acknowledge Him. Still, this up-and-coming band are talented, and on fire for Jesus, worshippers that give their all in whatever song they sing, be it original or worship covers. A great job well done for a group that I reckon could become the next Jesus Culture or Hillsong in a few years; ‘Every Good Thing’, that releases the day before Australia Day has been well worth the wait. Well done to Emily and the band for such a soul-stirring single, one that will be much appreciated by those who are fans of modern worship music, as well as music that tends to stretch the boundaries as to what worship music should be and look like!